VATICAN CITY (CNS): Pope Benedict XVI has asked a commission of scientific and theological experts to prepare a document on condom use and AIDS prevention, a Vatican official said. Cardinal Javier Lozano Barragan, who is head of the Pontifical Council for Health Care Ministry, said the document would focus, at least in part, on condom use by married couples when one spouse is infected. He said the document would be made public soon, but refused to give details about the commission’s conclusions. Cardinal Lozano was responding to questions in the wake of an interview by Cardinal Carlo Maria Martini, the retired Archbishop of Milan, who told the Italian magazine Espresso that use of condoms can be the lesser evil in some situations. In recent years, even as Vatican officials have criticised anti-AIDS condom campaigns, several bishops, theologians and Vatican officials have said they could envision situations in which condom use to prevent AIDS would be the “lesser evil” that can be tolerated. 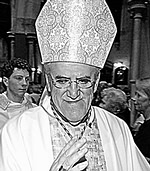 Cardinal Lozano, for example, said in 2005 that if a husband had AIDS, it was a woman’s right to ask him to use a condom. In the context of married love, the Church teaches that contraceptive techniques, including condoms, are immoral because they close off the possibility of procreation.